I think it's pretty safe to say that dinosaur tribal was the last thing most of us expected to see in a Standard set in the near future. But now it's here, and we have a curious deckbuilding conundrum. 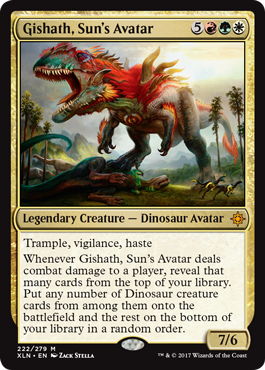 Dinosaurs are not particularly common outside of Ixalan (though there are rumors of coming errata to some older creatures), and so a Commander deck with Gishath is probably going to end up jamming almost every dinosaur from Ixalan, some Savage Twister effects, a few Rampant Growth-type cards, and forty or so lands for his high mana cost. Actually, come to think of it, that sounds sort of fun - and when he comes online and you're getting between up to seven of those dinosaurs for free each turn, kind of good too.